I have done some repairs on old dirt bike plastic where I cut and fit in a "I" shape patch. I used plastic of same thicness (scrap piece from newer car bottom shield) and fit it and glue it. The shape of the patch holds it together and the glue just holds the patch in place. I used a 3M glue from auto parts store that is used to glue on emblems. After sanding and painting they looked good. I have successfully done numerous plastic repairs. Fiberglass patch will not work and make a mess. Polyethylene repairs successfully with heating donor patches. ABS and some mixed composite plastics repair extremely well with plumbing cement. There are PVC (polyvinyl chloride) and ABS cements that will literally cold weld parts together. I agree you should do your research and try a small area to assess your results... but if you get the right material and cements together you will amaze yourself... find some donor material and try it on an edge you can cut off if not successful. Where appropriate you can overlap material to reinforce it adjacent to the missing/damaged bolt holes. Do not be afraid to ask a body shop for advice as this part is certainly quite rare. I have modified my Vintage Air evaporator's ABS plastic housing and converted my repro dash carrier with the stuff, among other things too. Also, after the on-line enquiries that I have made regarding the 3949856 sheild, I doubt it was fitted to any Camaro, let alone a BB-A/C Camaro at all. 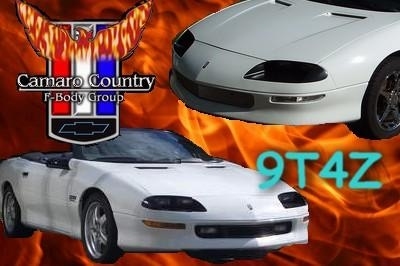 The only ones I have been shown by the on-line "Camaro community" were off Novas and other similar models, but never Camaros. 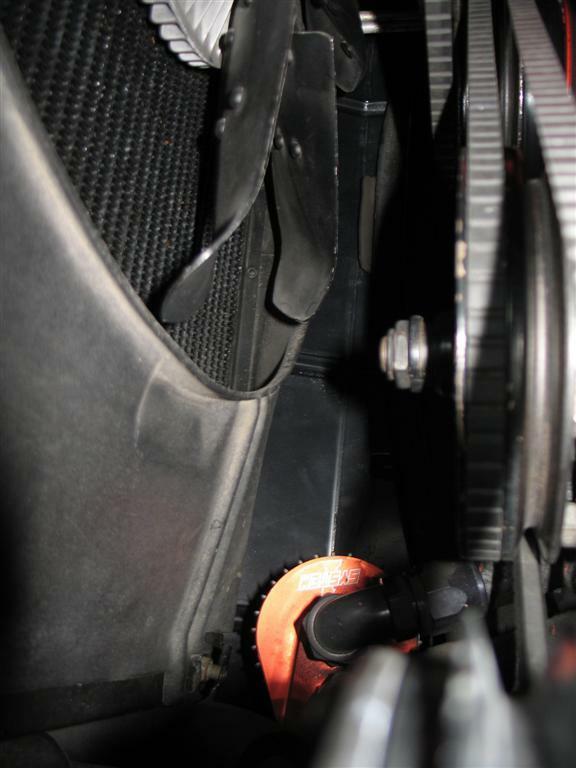 How many BB A/C Camaros were built and are still owned in OE condition, with not one owner prodiving an OE image of one on the car or at least a pic of all the 9 mounting holes on support and subframe from where it had been installed? Seems awfully strange to me. I personally doubt it was used much in TA racing - cooling wasn't a huge issue for most cars, it would be in the way, and it wouldn't hold up. I think this is the 2nd or 3rd one I've ever seen. I wonder if they were used in production the whole year or not. I am taking my car apart to restore and was going to send core support out for powder coat. I thought I had 3 extra holes in the bottom of support and about to weld them up. Checked the manual and found they are supposed to be there. Now feel I need to find the shield. My car was made 1st week in Nov.1968 and appears to have had it. Hope we can find someone to reproduce it. My 04C had one If someone would reproduce it, I would probably buy one.In 1976 went to the chevy dealer to get one ,they had know idea what I was talkng about!! That was a redesign which means there had to be an earlier design. I guess they could have changed the mounting of the shield. Was your repro made out of plastic or metal,and do you think it looks like the originals? It looks like pictures I've seen of an original. It's vacuum formed abs plastic as were the originals. The two guys behind this sure did their home work. I only had pieces of the original that I used to compare the thickness. My original question here a while back was "did it really exist." I received the re-pro 396 air shield from Ed Melberg, it is a really nice piece. I cant fit it to the car but I attached it to the core support and took some pictures. x66 714 Thanks for your help. It's possible that these panels were *added* to certain small black T/A cars (by some race teams) for aerodynamic purposes....? to 'slick' up the bottom of the chassis? Is that somebody on this website? ..or, do you have any contact information and price on this item please? I just revisited this post and looked back on the old posts where you wondered if they actually were installed at the factory. I worked at Jack Douglas Chevrolet back when these cars were 2 years old and don't remember the shields. I found out by finding the holes on my core support and was going to weld them up before powder coating. Glad I didn't, curiocity prevailed this time. 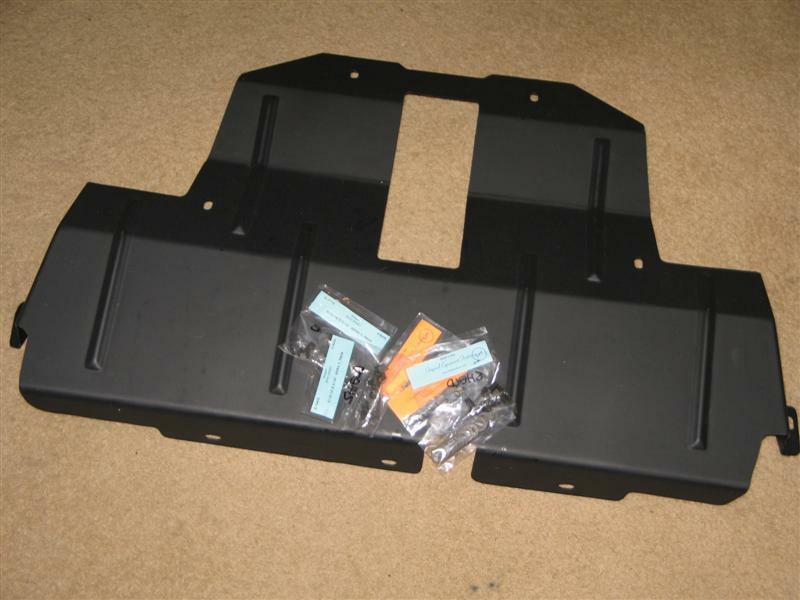 At the time I posted the picture I couldn't mount it to the car, but I looked for the holes in the subframe. They are there and one of the screws still has some of the plastic attached. I am sure most of these got torn up on parking curbs. The shield Ed makes looks really nice and matches any pictures I have seen. Unless your sheild was adapted from another car, you are the only person so far to have any evidence of having one..
Not at all saying that you aren't correct about your information, but where are all the others I wonder. Thanks to this thread and those who have helped me, I have been in touch with Ed and purchased a shield from him. It's currently on the slow-boat to me here in Australia.. I look forward to receiving it soon. Thank you. However, as I prepare for it's installation, I noted in the FAIM (C60-B4) that the screw #9420825 is not available through AMK..
Can somebody who has an original screw post some details and especially a picture -if possible, so I can order the closest available. Hex size, flanged?, thread size, pitch, with self tapping flute?, UHL (under head length) and finish. Going by P. Washer #9419275 (currently available from AMK as B-11266) and the 0.277-0.281" diameter holes to be drilled, I'm assuming a 5/16-18 with a tapping flute in an oil/phosphate finish. Yes, I can also vouch for the Plastex stuff - brilliant, especially the moulding bar!! Used it to re-create a bunch of mounting tabs on a VL Calais. 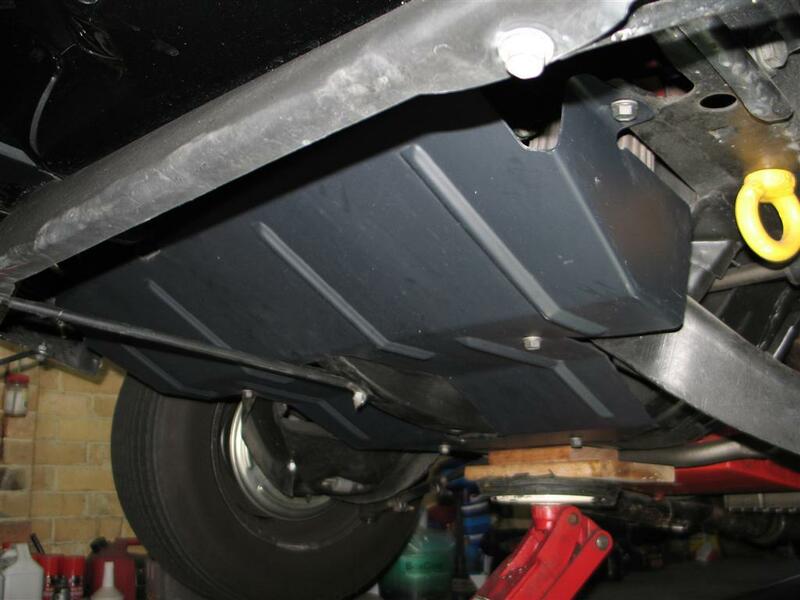 Any one have pics of the holes in the subframe/ I replaced my bent one with another. Steve & z10kl, I can't seem to find the screws I took out of my subframe, I will find them & take pictures. I checked and all my holes are 3/8" X 16. If i remember they were same as front fender bolts,tapered end, with a recess in the center of the bolt head. I wish I took a picture of them before I pulled them, but I didn't know I was missing the air shield. Here is a very ugly picture of the subframe before disassembling. I pointed out the screws & holes. 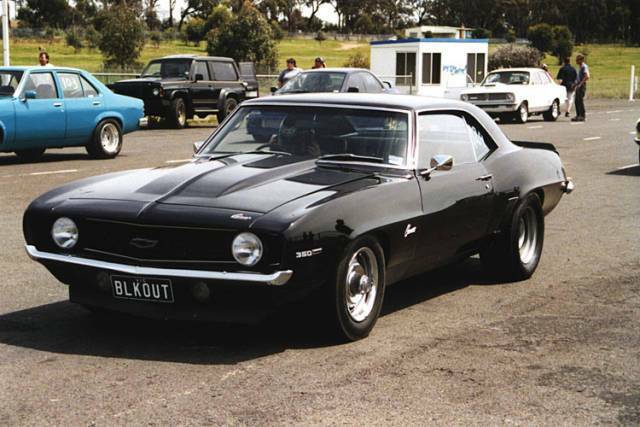 Steve: I have to tell you I was amazed & entertained for many hours over the Christmas holiday at what you have posted on the Australian muscle car forum. What you have been able to do in what appears as a small moderately equipted garage is amazing and shows you are very talented. Anybody that likes Camaro builds needs to check the link under his name. Great pic of the mounting holes. Mark x22, you are correct 5/16" bolts. I have been looking at too many metrics or just can't see like I used to. Anyway I pulled out my subframe and shield to bolt it up. The 2 bolts that go directly into the cross member are 5/16 with a .280" hole. But the other 4 holes only measure .250" so I don't know what screws go in there.The holes are not stripped, a 1/4" fastener is too small. Do you not have the bolts that came out of the holes? Here's a 10c early Norwood car that has the holes in the subframe. Are there any known real BB AC cars with out the holes? Good stuff George.. Thank you for the detailed pics. I finally decided to fit the Air Shield that I purchased from Ed Melberg. 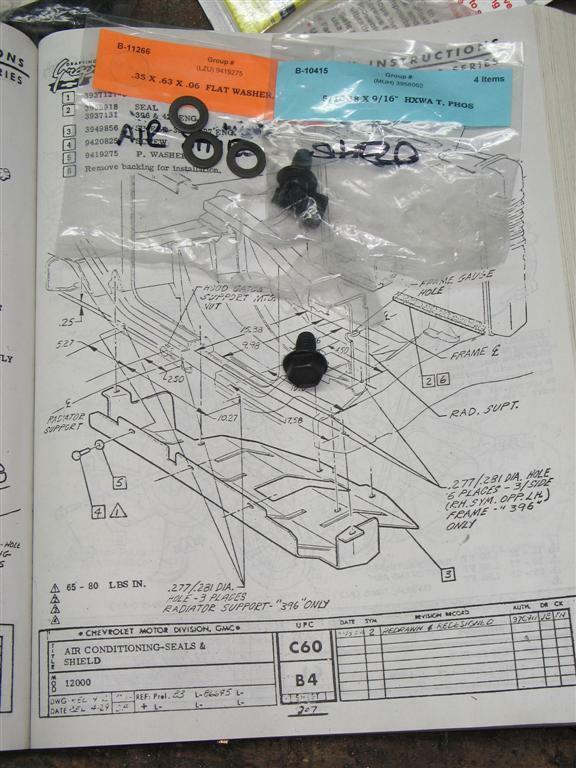 The shield is shown here in the C60 (air/con) chapter of the Assembly Manual with all the dimensions for the mounting bolt holes. Lots of detail.. Both they and the shield are accurate and the shield fitted easily. For drilling the front side of the radiator support, I had very little room for getting in a drill between the valance, let alone one with a drill bit in the chuck. So, I put a center-drill in my die grinder and it fitted and drilled easily. 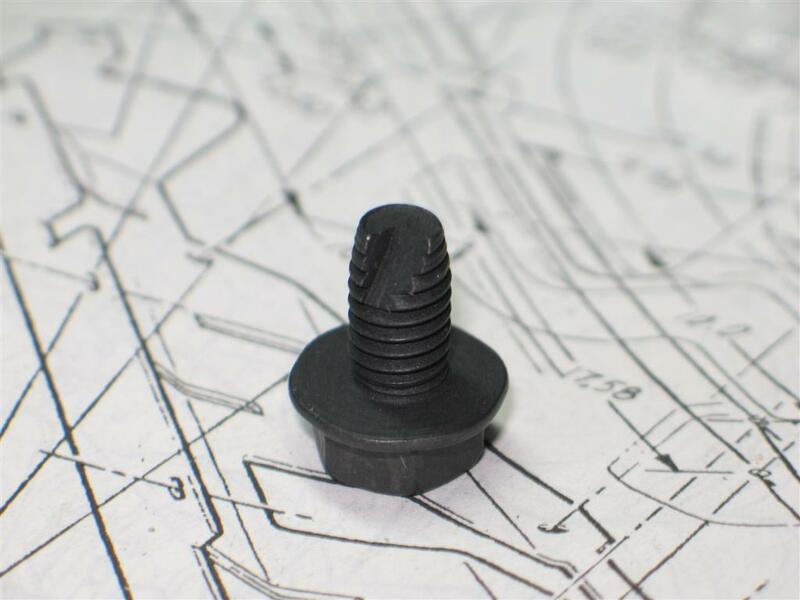 These bolts from AMK (B-10415) are not THE correct bolts as the correct ones aren't available anymore, but they are very close and have the same self tapping flute in the thread like the correct ones. (-just like the 68-69 fuel and brake line clip bolts do.) 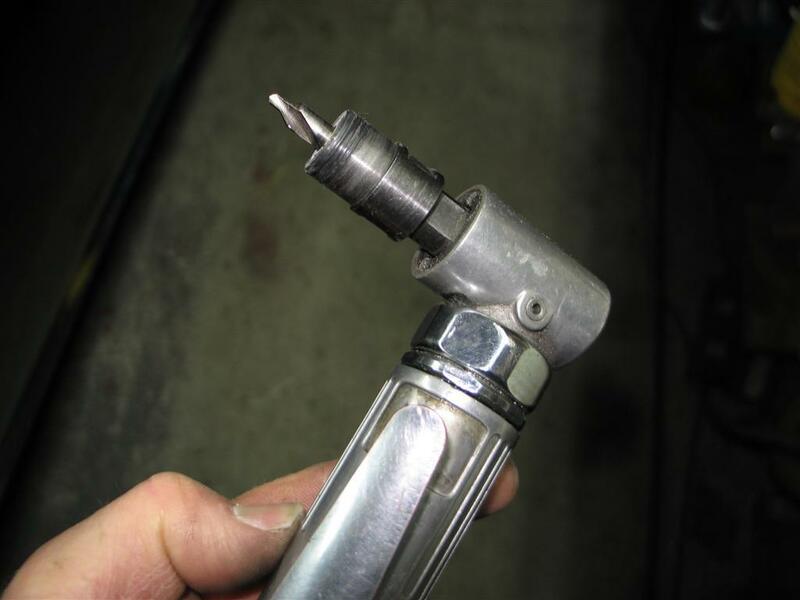 They cut their own threads really well and just by using a ratcheting ring spanner to tap and install. The whole idea of the shield is to maintain a low pressure area behind the radiator when the vehicle is at speed. This encourages the most amount of air to pass through the radiator and not allow air from under the valance that has "cheated" the radiator to fill the low pressure void. Now. all I need is a hot day to see if it makes a difference.. The other day (without the shield) was a humid ~30°C (86°F), and the engine was cruising (@3500) with the temp at 190°-200°F with the A/C on high..
With OE thermostats being 195°F, that temp is hardly a concern, but I have a 170°F 'stat fitted at the moment and would like a little reserve up my sleeve for stinking hot days. Otherwise, it rarely makes it to 180°F on cooler days with the A/C off, so the system works well. Switching on the A/C typically adds 10°F.